A PDB snapshot is a point-in-time copy of a PDB. You can create snapshots manually using the SNAPSHOT clause of CREATE PLUGGABLE DATABASE (or ALTER PLUGGABLE DATABASE), or automatically using the EVERY interval clause. A PDB snapshot carousel is a library of PDB snapshots. For example, while the production PDB named pdb1_prod is open and in use, you create a refreshable clone named pdb1_test_master. 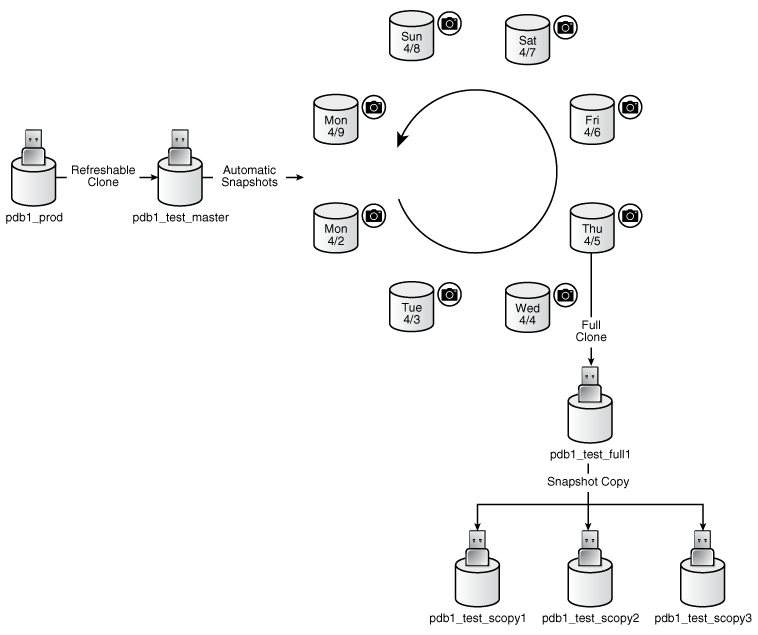 You then configure pdb1_test_master to create automatic snapshots every day. When you need new PDBs for testing, create a full clone of any snapshot, and then create sparse clones using CREATE PLUGGABLE DATABASE ... SNAPSHOT COPY. A typical strategy is to take a snapshot of a PDB every day at the same time. Another strategy is to take a snapshot manually before data loads. In either case, a PDB snapshot carousel enables you to restore a PDB using any available snapshot. The data files of the PDB snapshot reside in an archive file on the file system. No archived redo log files are included. Typically, the archive is stored in the same directory as the data files for the PDB. For system-generated snapshot names, snap_ is prefixed to a unique identifier, which contains the snapshot SCN. The archive has the file extension .pdb. The database takes a snapshot using an implicit USING SNAPSHOT clause. You cannot specify the SNAPSHOT COPY clause when taking a snapshot with CREATE PLUGGABLE DATABASE SNAPSHOT. A PDB snapshot created with the USING SNAPSHOT clause and a snapshot copy PDB created with the SNAPSHOT COPY clause are two distinct types of snapshots. The USING SNAPSHOT clause creates a full PDB that does not need to be materialized. The SNAPSHOT COPY clause creates a sparse PDB that must be materialized if you want to drop the storage snapshot on which it is based. 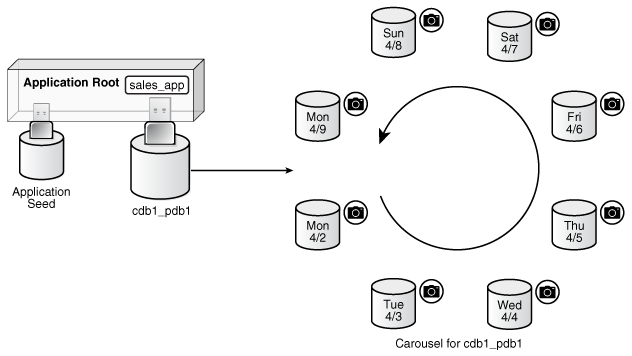 Although a snapshot in a PDB snapshot carousel is always a full PDB, you can take a snapshot copy of a snapshot in the carousel. In this case, the snapshot copy is a sparse clone. 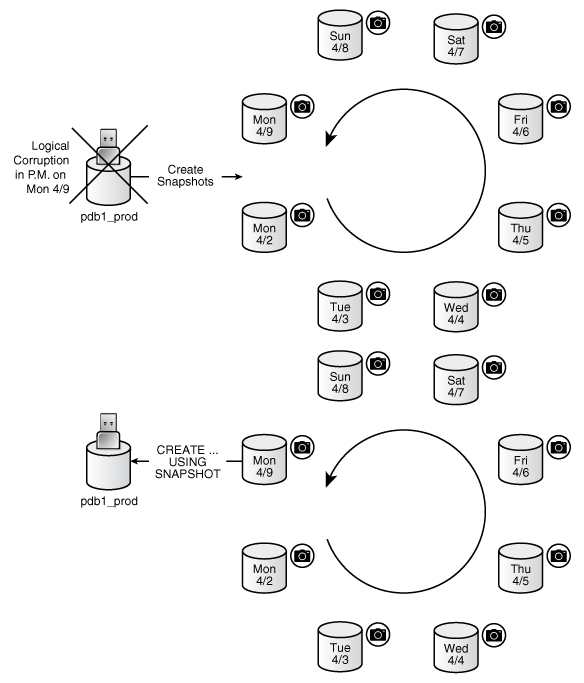 "How a Snapshot Copy PDB Differs from a Standard Clone"
The DBA_PDB_SNAPSHOTS view metadata about the snapshots, including name, creation SCN, creation time, and file name. The database administrator must have the privileges to create a PDB and drop a PDB. If you do not specify a PDB snapshot name, then the database generates a unique name.